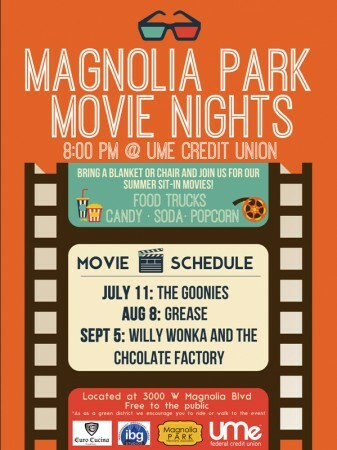 Magnolia Park Movie Nights continue with an outdoor screening of Grease Friday evening, August 8. 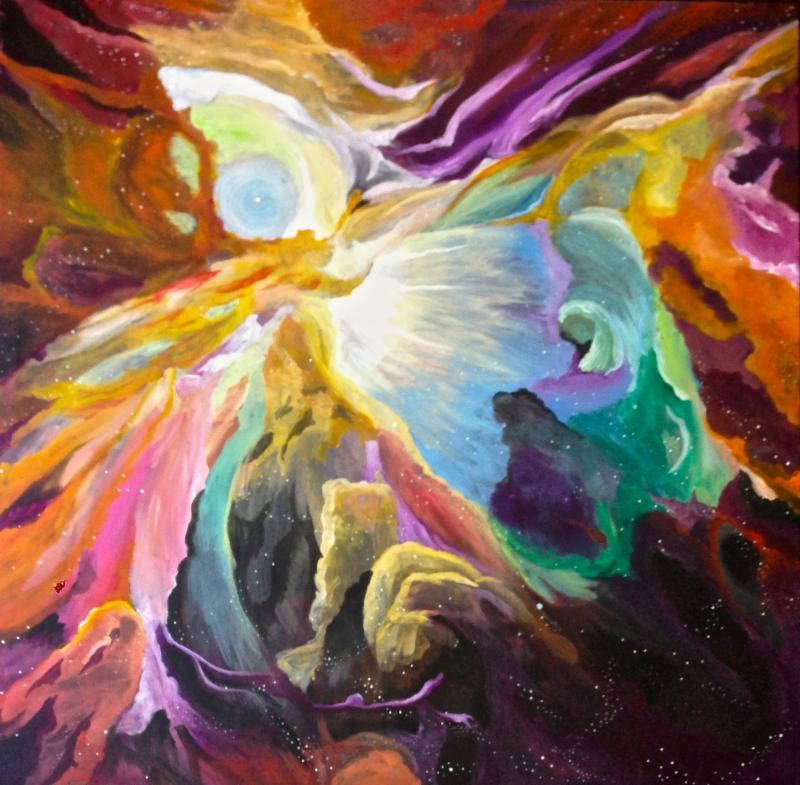 Towns Burr Gallery hosts a full schedule of events for Second Saturdays on August 9, including a meet and greet with featured artist Katie Runnerstrom, live music and refreshments. Friday’s Movie Night kicks off at 7:00 p.m. with food and treats available from Baby’s Badass Burgers, Rockin’ Ice, Hula Pop Kettle Korn, Rocket Fizz, The Jelly Bean Factory and Mikey Melts Grilled Cheeses. Grease begins at approximately 8:00 p.m. at the UMe Credit Union parking lot. Walk Bike Burbank offers a free bicycle valet to help encourage people to ride to the event. Frenchy’s Beauty Parlor, named for the Grease character, will also be set up at the Friday night event. Flappers Comedy Club hosts a performance at 7:30 p.m. and will give away free tickets to their shows. The Burbank Police Department will also be on hand with their vintage police car for photo ops. 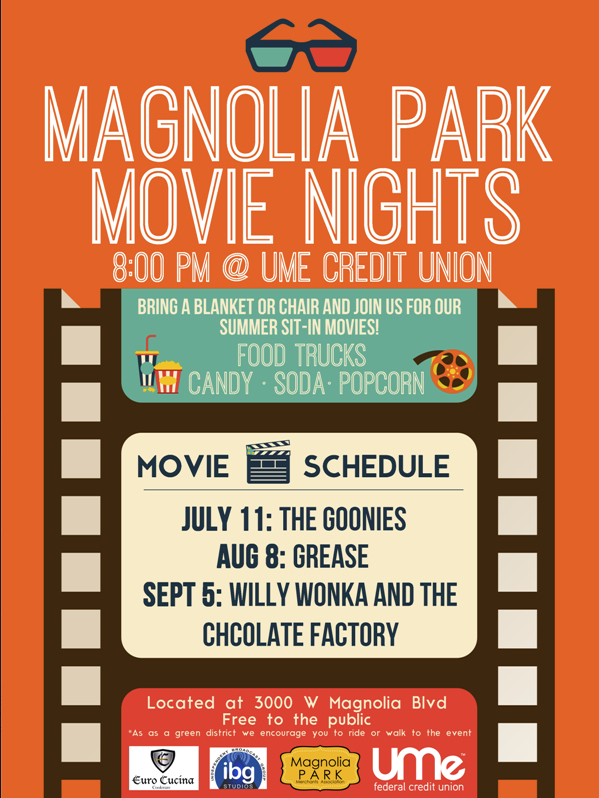 Magnolia Park Movie Nights debuted July 11 with a screening of The Goonies. Organizers suggest low chairs and blankets for the audience. Picnic baskets are also welcomed. UMe Credit Union is located at 3000 W. Magnolia Boulevard. Towns Burr Gallery has a big night planned for Saturday evening, August 9, and the growing Second Saturdays monthly event. The gallery exhibition includes recent works from Runnerstrom. Live music from Dr. Blues American Roots Revival Band, food and drinks are planned for the party. Towns Burr Gallery is located at 3609 W. Magnolia Blvd. and Second Saturdays runs from 5:00 to 9:00 p.m., with regular gallery hours on Saturdays opening at 10:00 a.m. More information on the gallery can be found on their website www.townsburrgallery.com. This entry was posted in Magnolia Park, News, Nightlife and tagged grease, katie runnerstrom, Magnolia Park, magnolia park movie nights, second saturdays, towns burr gallery on August 8, 2014 by Lisa Paredes.